The parts incorporated in this chair are original pieces used on draft horses in the 19th century for farming and logging. The front legs are wooden hames. The seat is woven from leather harness strapping and the back rest is a farm collar with a single tree above. 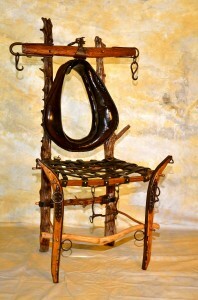 If you desire, the artist can make a customized chair using your own equestrian supplies. Call for details and pricing.